To bring a bit of diversity to our SEO job board, we have compiled a selection of interesting jobs in the search engine marketing and search engine optimisation industry in Sydney, Australia. If you are a all-rounder SEO/SEM professional, you might be interested in one of these. - Google Adwords - Account Strategist - Sydney: 4 years account management experience, proven track of success in the online industry. For more information click here. - Account Manager/Director at 24/7 Real Media (Outrider) - Sydney: SEM Account Management experience required, good inter personal skills and strong understanding of Internet Technology> Click here for more information. Recently, I came across an interesting post from Hit Search Limited, a US British search engine marketing agency, which compared the trends in search volume for the keywords 'seo' against 'ppc in different markets (US, UK, Australia, and Canada) using Google Trends. According to the graph below, which displays the comparison of search volume for each keyword over the last 12 months in Australia, the volume of search for the keyword SEO overtook the search volume for the keyword PPC in April 2008. On the other hand, the volume of search for the phrase 'PPC' has decreased for a couple of months. While this trend obviously reflects a growing interest for search engine optimisation, it might be a little ambitious to assume that SEO is taking over PPC in Australia for the following reasons. Another factor that could explain the difference between the reality in the market and the trends displayed by Google Trends, is the fact that Pay Per Click (PPC) advertising can be named differently. PPC can also be referred as Search Engine Advertising, Search engine marketing or even CPC (Cost Per Click) Advertising. In the current graph the search volume of all these phrases are not displayed. If you add the search volume for all the different ways of naming PPC, and displays it as a graph, the volume of search might still be way over the volume of search for the keyword SEO. While not reflecting the accurate popularity of the CPC advertising channel, this graph clearly shows that the keyword PPC is not searched as much as it used to be and therefore this reflect a shift in the way of naming this type of advertising. As correctly mentioned by the author of the post on Hit Search, it would be interesting to see if the Australian market will reflect this trends in the next couple of months. 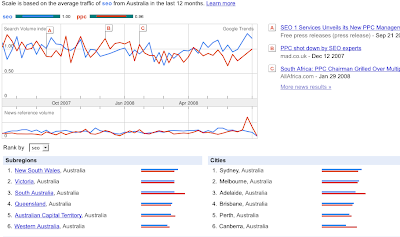 Clear signs in the Australian market would give a more legitimate answer to the question: Is SEO mainstream in Australia? Another interesting aspect brought by this comparison is the fact that Google Trends actually measures the popularity of one keyword over time. While this information is useful, it still has to be analysed with care as many factors are not reflected with this tool. In House SEO Specialist role that also includes working on various internet marketing activities (SEM etc..). The Salary package is up to $100,000. Not long ago, Google handled sub domains as different domains. The use of sub domains presented some real advantages for SEO as it allowed to rank in the search engine result pages with not only your main domain, but with the sub domains (if relevant of course). To avoid search results spam (having a list of sub-domains in SERPs), Google no longer treats sub domains as separate domains, Google has made some changes to its algorithm to create some association between the sub domain and the top level domain. Even if sub-domains are not what they used to be, they still makes sense and can be useful if they are used properly. As Matt Cutts pointed out in his blog, sub-domains should be use if the additional content you want to publish is different from the content of your current top domain. Vanessa Fox also mentioned that sub-domains should be use if it makes sense for business purposes. Let's say you are well know brand and want to promote different activities or content, it is quite logical to use a sub-domain if you want to capitalise on your brand or associate your products to the brand. A good example of this is Google that uses different sub-domains for each of its products. Google is not the only one, there are many other websites that successfully use sub-domains as part of their search strategy. In Australia for example, Real Estate.com.au has used a sub-domain to expand their real estate classified to renovations tips. Ninemsn is also running the same strategy. - Using sub-domains, you content will be seen as a 'different' entity in search engine and will be able to rank on its own. - Sub-domains are very effective if you want to run a specific link building strategy. For example, many directories do not allow link to sub-folders, but do allow links to sub-domains. Using sub-domains, it will be easier to conduct a proper link building strategy. - A sub-domain can also have advantages to increase the link popularity of your top level domain. As sub-domain is seen as a separate entity with its own links and is own Page Rank, relevant back links from your sub-domain will have an impact (maybe small) on the link popularity of your main domain. - Sub-domains are separate entities with their own Page Rank, so starting a new sub-domain is really similar to start a new website. You will start from scratch ,which means that you will need to build links and credibility. - A sub domain might make sense from a SEO point of view (if the user does not need to type the URL) , but they are not the most user-friendly URLs as they are long and are likely to be misspelled. - Finally, the constant changes in the Google algorithm can always have an impact on your website. Google has already tweaked its algorithm to reduce the impact of sub domains. If Google decide to treat sub domains as sub directories all the advantages listed above (and all your efforts) might not be valid. To conclude, sub domains should really be used for real content or business reasons. If you are a large content website and want to expand to another area, sub-domains make sense. If your brand is well know and you want to associate your product/content to it, sub domains are great. However, if you want to add a blog to your website with similar content and small time to promote it, it will make more sense to use a sub directory.